Book tour is hard work. Eight cities in ten days? That kind of hard work. 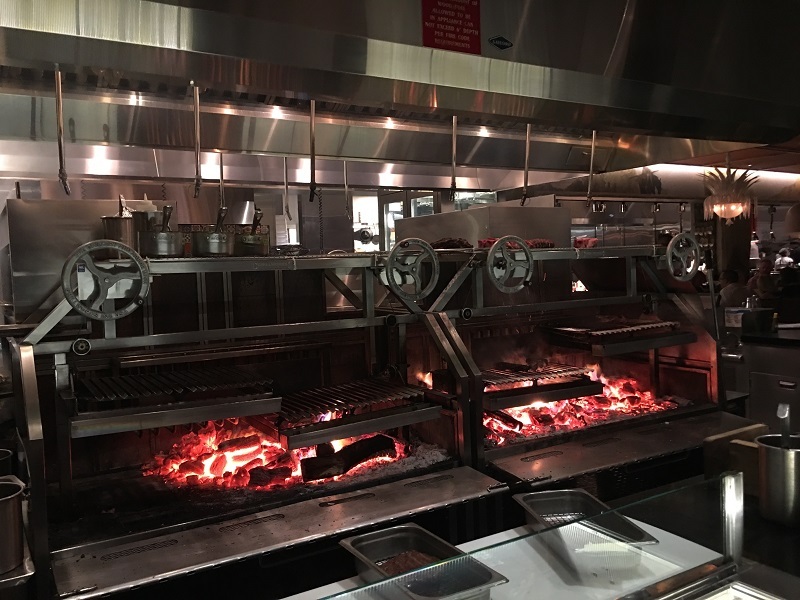 But it definitely has its perks, and one of them is discovering new restaurants where the wood fires burn bright and the food comes to the table the way I like it: slow-smoked over smoldering hickory or grilled over blazing oak or mesquite. So midway through the year seems like a great time to share some of my best finds for 2018. Do you have a great grill restaurant or barbecue find in your area? Share it on my Facebook page, via Twitter, or on the Barbecue Board. I’m drawn like a moth to a flame when I learn of a restaurant with a wood-burning grill. It helps that it’s now one of the hottest reservation ins trendy Williamsburg. I speak of Lilia, housed in a cavernous former auto body shop, the latest venture of Michelin-starred chef Missy Robbins. Near the bar is a grill custom-built by Grillworks; you’ve seen a smaller version of this Argentinean-style grill, a perennial favorite of viewers, on my TV shows. Littleneck clams, heaped with buttered bread crumbs and chile oil, get the live-fire treatment, as do succulent lamb steaks with a spiced fennel and celery slaw, veal flank steak, swordfish, and chicken leg quarters. But don’t let your grilling obsession distract you from the remainder of the menu. Especially, the pasta. Surely, multiple visits are in order. 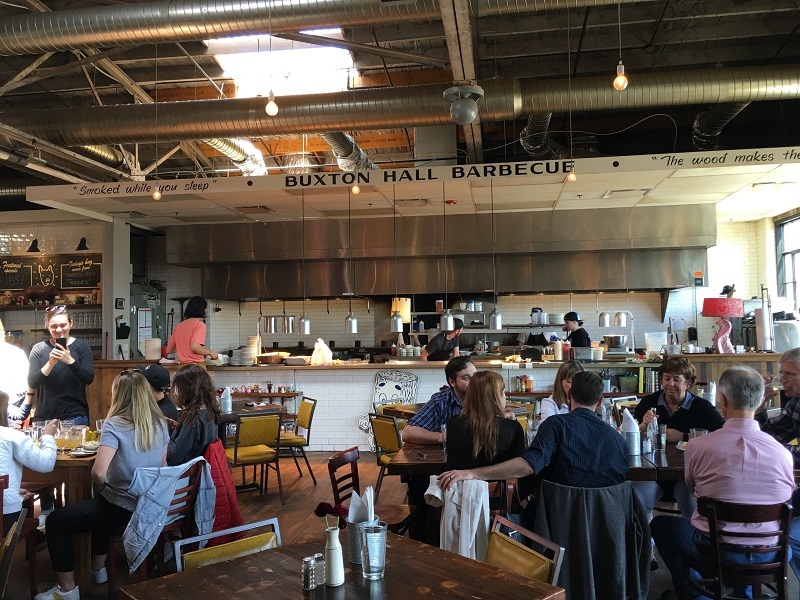 Two James Beard nominees for “Best Chef, Southeast,” teamed up to create one of the most atmospheric barbecue restaurants I’ve eaten at this year. Business partners Elliott Moss and Meherwan Irani opened Buxton Hall in 2015, and the smoke’s been rolling enticingly through this hip mountain town ever since. Whole pit-roasted, vinegar-mopped pig (smoked for 18 hours) reigns here, but smoky fried catfish and chicken are on the menu, too. The proteins and greens, like collards and butter lettuce, are all sourced from local farms. Meanwhile, you can almost feel the building’s history oozing out of its cement pores. In its past life, it was a paper sales company, a boat and auto showroom, and in yet another incarnation, a wood-floored skating rink. Silhouettes of skaters and an admonition—“NO FAST SKATING”—can still be seen in faded black paint on the walls. One of the on-site destinations for me and the crew of Project Fire was a nearby restaurant that describes its fare as “refined ranch cuisine.” Chef-partner John Cox was inspired by the flags of the two states he’s called home—Texas and California—when he named the Bear and Star. Meat comes from the 714-acre Fess Parker ranch seven miles down the road. Wagyu cattle born and raised on the ranch are finished on grape pomace and spent grains from the family’s winery and brewery. Yeah, it’s that good. Chickens, quail, pigs, and heirloom vegetables are also supplied by the ranch. The chef’s technique of swaddling meats in bourbon-soaked cheesecloth is genius. Kettle corn mixed with brisket burnt ends. Need I say more? And that’s just part of the allure of Loro, the distillation of two mega culinary talents, James Beard Award winners Aaron Franklin of Franklin Barbecue and Tyson Cole of Uchi. A 72-inch state-of-the-art Grillworks Argentinean-style grill and two J & R Oyler barbecue pits do the heavy lifting in this Tex-Asian roadhouse, opened just a few weeks ago. Bavette (sirloin flap) is salted, cold-smoked, then given a sous vide bath in brisket fat until being grilled over live-fire and served with a shishito pepper salsa verde. Even vegetables get their turn in the smoky heat; don’t miss the oak-grilled snap peas or Texas sweet corn with a tangy yuzu aioli. Yes, fusion food is apparently a thing in Austin. Japanese ingredients and techniques drive the menu at this casual, funky establishment. (The walls are covered with a large Texas State flag, Japanese tchotchkes, and smoke from the building’s former tenant, Live Oak BBQ. Kemuri means “smoke.”) As they do in tapas bars or gastropubs, small plates and innovative cocktails rule here. Bring your friends, as sharing is the only way to roll—unless you’ve ordered ramen with brisket. You’ll want to keep that to yourself. Among the smoked meats are pork ribs, eel, duck, sausage, beef tongue, and more. One of my favorite dishes was “brisket hot pocketz,” smoked brisket encased in tofu skins. Kemuri Tatsu-ya was named one of the Best New Restaurants in 2017 by Bon Appetit. “C’mon, guys, this is why you are here!” Printed at the top of the menu page entitled “From the Fire Pit” is this quote from award-winning chef José Andrés. 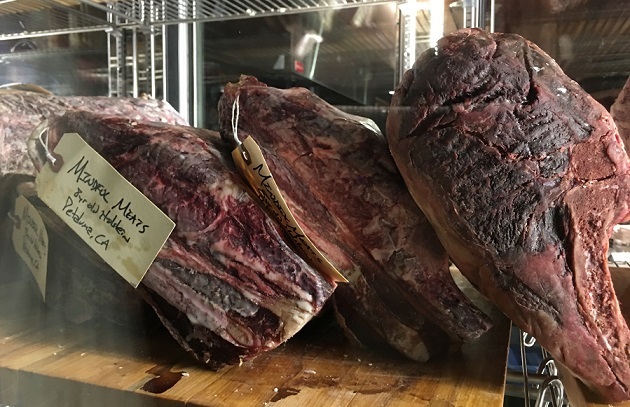 To call Bazaar Meat at SLS Las Vegas a steakhouse would be to minimize its carnivorous depth. Multiple grills and wood-burning ovens produce such indelicate delicacies as whole roasted suckling pigs presented in Spanish cazuelas (shallow earthernware dishes), authentic Kobe beef, Spanish-style bone-in ribeye grilled over oak, Jidori chicken (the same chicken we used on the set of Project Fire), tuna belly steak, veal chops, and other top-shelf proteins. Come for the meat, but don’t miss the “salt air” margaritas. I couldn’t possibly leave out my home town of Miami. Overlooking Biscayne Bay is Amaro at Paraiso (it’s located in a new 7-block area called the Paraiso District). James Beard Award-winning chef-owner Michael Schwartz pays homage not only to local ingredients and live-fire cooking, but to the unique culinary threads that make up the colorful fabric of South Florida. So you’ll find a mixed grill featuring grilled skirt steak, chorizo, short ribs, and sweetbreads as well as a seafood-centric counterpart with cobia, octopus, scallops, and giant prawns. Most entrees are paired with bold-flavored sauces like smoked paprika aioli, chimichurri, or green tomatillo salsa. I am partial to the grass-fed rib steak from a farm in Northern Florida served with a side of charred snap peas.